VpCI-377 leaves a clear, dry film that can be easily removed by mineral spirits or other alkaline cleaners. It is a water-based concentrate designed as a complete replacement for oil-based preventatives for indoor protection of equipment and components. VpCi-377 is a corrosion preventative liquid that meets tough anti-pollution requirements. The wide dilution range with water (0.5-20%) allows flexibility to customize the length of protection required and the applied cost per square foot. It provides up to 24 months of indoor protection and is not intended for outdoor use. Typical applications of this thin film coating for dry storage include castings, tubular parts, finished parts, gears, pumps and housings, textile and printing equipment, structural steel, sintered metals, bars and roll stock. VpCI-377 can be used as an additive to parts washers and rinse water systems, hydroblasting and hydrotesting. It protects ferrous and non-ferrous metals including carbon steel, stainless steel, galvanized steel, aluminum and copper. Allow surface to thoroughly dry after application and before placing item in storage. 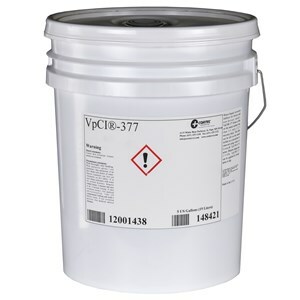 VpCI-377 may be applied by spraying, dipping or can be used in parts washers and rinse tanks. Available in 5 gallon steel pails (Cortec Product Code 12001438) or 55 gallon metal drums (Cortec Product Code 12001439). 5 gallon drum weighs 50 pounds and ships under our standard shipping rates. The 55 gallon drum must be shipped by truck. We will provide you with a freight quote before we ship this product. Note: The pH of VpCI-377 needs to be above 8 in order to be effective. Quantity Discounts are available for Large Orders including liquid totes and bulk shipments. Please call for more information.